First thing first: if you’re teaching in an Oklahoma classroom next year, I’m rooting for you. I want you to be successful. I want you to have students you love, parents who support you, colleagues who help you grow, and administrators who provide you with the resources you need. Once you’re signed, sealed, and delivered, I really don’t care about how you got here. You might have been a 4.0 student in college, or you might have just squeaked by. You might have chosen the teaching profession at age 20 or age 50. You might be in that classroom for one of 100 different reasons, and you might have taken one of 100 different pathways to get there. I don’t care; I wish you well. Nothing in the Oklahoma Teacher Preparation Act shall restrict the right of the State Board of Education to issue an emergency or provisional certificate, as needed. 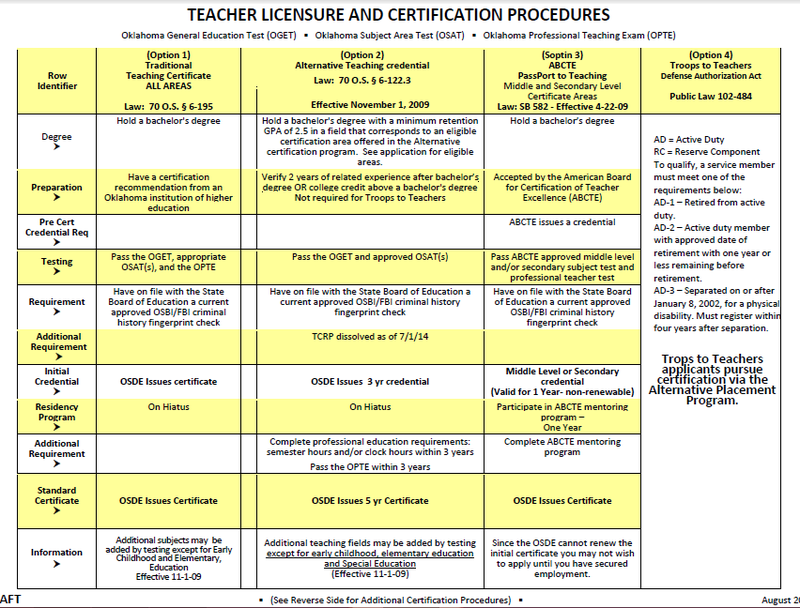 Provided, however, prior to the issuance of an emergency certificate, the district shall document substantial efforts to employ a teacher who holds a provisional or standard certificate or who is licensed in the teaching profession. In the event a district is unable to hire an individual meeting this criteria, the district shall document efforts to employ an individual with a provisional or standard certificate or with a license in another curricular area with academic preparation in the field of need. Only after these alternatives have been exhausted shall the district be allowed to employ an individual meeting minimum standards as established by the State Board of Education for the issuance of emergency certificates. In other words, if a school district can document the tall buildings it has leaped in trying to find a teacher, when there are just no suitable applicants (yes – we still reserve the right to interview and decline to hire people who we just can’t imagine putting in a classroom with children) it can petition the SBE for an emergency certificate for a prospective teacher. Keep in mind that there are many pathways to gaining either a traditional or an alternate teaching certificate. 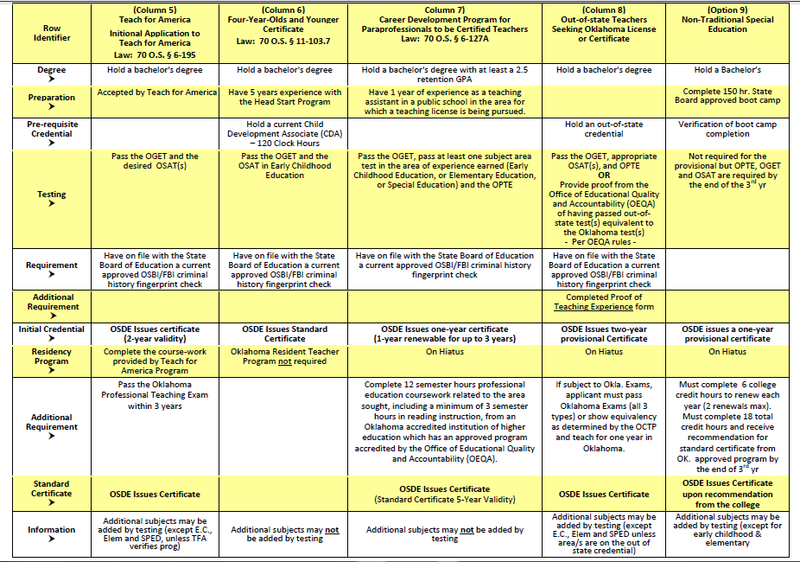 Procedures published by the Oklahoma State Department of Education provide nine columns of pathways to earn a teaching certificate. That’s right – there are eight ways in addition to simply going to college, earning a degree, and beginning your career in the classroom at 22 or 23 years old. It’s staggering – 182 emergency certificates this month, but 189 for the entire year of 2013. As I said at the top, though, I’m rooting for these people. I’m cheering on all of our teachers. Still, even with the pathways and emergencies, we just don’t have enough teachers to staff our schools. Back in March, during the #oklaed chat prior to the rally at the Capitol, several of the usual suspects commented on how the teacher shortage has impacted their schools. A1 – I continue to hear #OklaEd stories of class sizes growing and courses being cancelled due to a lack of qualified applicants. Last year, hundreds of positions were never filled by a permanent teacher. I’ve heard more than one legislator say that businesses have this happen all the time; there are always an acceptable number of positions open. This is yet another reason that public education doesn’t fit a business model. Maybe these numbers are acceptable at AT&T, Apple, and Dell. They aren’t acceptable where we’re trying to teach seventh grade math, AP Physics, or first grade everything. If you don’t believe me, ask the parents and students impacted by these shortages. If the AT&T store is shorthanded, I have to wait a little longer for my service. If a school is shorthanded, instruction can grind to a halt. If a teacher materializes two months into the school year, that time is just lost. This is still the most critical issue in public education. It’s going to take a serious investment to get more teachers into classrooms – an even greater one to get them to stay. A few weeks ago, I answered the blogger challenge, Why Teach, and ended with a promise to write a sequel, Why Teach Here? Well, since then, I’ve been a little distracted. I’ve started and stopped several times. One distraction in particular has been the adjunct class I teach for Southern Nazarene University. This past week, I showed my grad students this 10 minute clip discussing motivation. It’s been on the Internet for years. Rob Miller even wrote about it (and the book Drive by Daniel Pink that inspired it) back in 2013. In the first few minutes of the video, the speaker talks about the research on incentives and how poorly they serve as motivators. Our take in class this Wednesday night was that money is important, but that people who have a job they love would need significant sums of money to leave what they’re doing. In other words, if you are a teacher and love your job, you’re not going to a neighboring district for a $500 or even $1,000 pay raise. The amount of money that it would take to disrupt their lives was varied, but in all cases, much more significant than that. After we finished the video, we went back to the five minute mark and listened to what I consider to be the key takeaway. The screenshot shows three factors that Pink says lead to better performance and personal satisfaction: autonomy, mastery, and purpose. But what does that have to do with this post? Using this framework, I’m going to try to answer the question Why Teach Here? in a general sense – rather than trying to sell you on a specific district or school. As a teacher, you want to know that you work for a district and for people who value the unique qualities you bring to the classroom. The more decisions that are taken out of your hands, the less comfortable you become. Yes, there will be mandates – local, state, federal. No teacher has absolute autonomy. Districts and schools do, however, have some discretion over how to implement those requirements – or how many more to add. The key to achieving this balance is to get teachers involved in agreeing to common expectations in a school. What are all teachers expected to do? What decisions to teachers get to make for themselves? A high-performing school with many veteran teachers can slide that continuum pretty far to the high-autonomy side. Too often, though, leaders will take over a school and want to make a huge imprint right away – in the process, damaging many of the conditions that make veteran teachers want to stay where they are. Additionally, we need to realize that just as no two students are exactly the same, neither are any two teachers. We all have gifts and skills that make us who we are. No student ever wants to hear, I wish you were more like so and so. Teachers don’t either. I can’t teach English the exact same way as the people I admire the most in my discipline. My work is informed by their example, and I have appropriated many of their ideas – always with my own spin, though. In class, I like to say that our goal for Curriculum & Instruction should be to get people on the same page without literally getting them on the same page. (If you know me and how much I detest the overuse of the word literally, then you understand how serious I am right now.) We need a common set of goals across the state for subjects such as fourth grade math. These are the standards. We may exceed them, if our students are ready and willing. We may improvise in how we reach them. We just shouldn’t be carbon copies of the next classroom, school, or district. Pink says that mastery manifests as the desire to get better at stuff – or words to that effect. Think about that for a minute. If you are an exceptional teacher, you were either born that way or you worked really hard to get there. For most of us, it was the latter. We had principals who supported high-quality professional development and allowed us to take risks. We had colleagues who were experts in the state or nation in our disciplines. We were young and teamed with veterans who never lost their idealism. Even if we were rock stars as young teachers, with shining moments that set us apart in our buildings, how many great days did we have in a year? I can still remember my first year teaching. Before school started in August, we had a week-long training from the Oklahoma Writing Project in writing across the curriculum. I had activities that I could use for weeks and ideas that I could modify for other purposes. I had that principal who supported me. I had that eighth grade team that collaborated for the best interest of our students. Still I believe I had more days that year in which I struggled than days in which I didn’t. The struggle fueled my desire to learn – to get better at stuff. Think of the best teacher you ever had growing up. Was he/she better with content or better with people? One of my all-time favorites, Bill Fix from Norman High School, was my Physics teacher in 12th grade. His class was the first time I ever enjoyed math. Yes, I know Physics is a science course, but there’s a ton of math in there too. I had always done well in math, but never enjoyed it. Mr. Fix was good at teaching the content, but he was also good with people. It was, for me, the perfect mixture of lecture (probably about 15%), deskwork (maybe another 15%), labs (65%) and tests/quizzes (at most 5%). We did stuff. We launched things across the room and then worked with our groups to determine how the different variables worked together. We didn’t look up formulas and then take off to the lab. We did the labs and then worked to create the formulas. When it was frustrating, he made it less so. When we got it right, even though he’d seen it before a hundred times, he was thrilled for us. I think Bill Fix enjoyed teaching because he was good at it. Or maybe he was good at it because he enjoyed it. Either way, it worked for me. What also probably worked for him was that he had the autonomy to develop the mastery he needed to be successful in the classroom. No one can hand you a packaged curriculum and tell you to master it as a teacher. That’s not how it works. You have to find your own way, and for each of us, the path to mastery is different. All of these are great examples of how we as educators find and restore our sense of purpose. In spite of the mandates, the interlopers who want to bless our profession with a corporate style of management, and the salaries that lead many teachers to take second jobs, we do what we do because we know it matters. That’s our purpose. That’s our drive. All three qualities work together. When one expands, the other two seem to expand with it. When one contracts, so fall the other two. If you love your job you likely have at least an abundance of two of these things. If it’s only two, please tell me that purpose is one of them. On the other hand, if you don’t love your job, or if you’re an administrator whose teachers don’t love their jobs, think about ways to increase at least one of these three traits. One more thing: if autonomy, mastery, and purpose matter to you, imagine how much they matter to your students. Keep that in mind as summer winds down over the next few weeks.